It doesn’t look it but what you see here is more incredible than the pyramids of Egypt.What you see here is unexplainable.Unbelievable.What you see here cannot be explained by the greatest minds of the world. 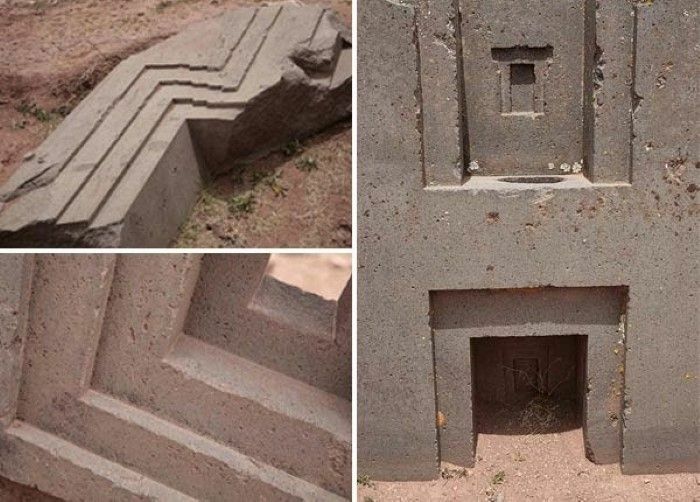 Apparently built by the aymara Indians and ,estimated to be over 14,000 years old.It is one of the oldest temple complex in the world. The reason why it’s so astounding are the impossibilities that stood in the way of building this colossal structure. At 4000 meters above sea level the only thing that grows here is grass .That means there were no trees.It makes you think what could they used to transport these stones.No sleds, no rollers.Nothing to carry them on.There being no trees to transport the stones and the quarry being 10 miles away.It would have been next to impossible to get the stones there destination.I mean what could they used?There’s nothing here!Just a wasteland of grass and soil. Some of the stones are over 400 tonnes.I can’t imagine how human beings would be able to shift amount of weight with such primitive tools? and also these stones carved PERFECTLY…. !!! Carved so perfect that from one end of to the other end.It is not 1 millimetre off. Look how precise this block is cut? And believe it or not ,that wasn’t the hard part of the story..The hard part was,that structures were made out of DIORITE… !!! Diorite is one of the hardest stones on the planet.So hard in fact,the only other stone in the world that can cut ,it is Diamond..then only way, the Aymara indians to cut these stones is ,if they were using diamond tipped tools. If the Indians were able to do this,they must be pretty clever people.But the Aymara Indians didnt even have there own writing!!! that means no plans,no blueprints, no proper communication. How are you going to built a complex structure like that,if you cannot communicate with the people you are work with? It is truly incredible and hard to believe, that the stone age man build this without any help from a mordern technology. Did a highly advanced society once exist globally?